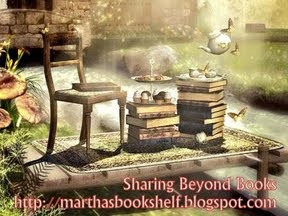 Hello again on Saturday night and Welcome to Sharing Beyond Books, SBB! Thanks to everyone who commented last week. Well a large group, nine, either don't watch much TV at all or don't watch cooking shows so no favs for them. Several shows got mentioned twice, including Master Chef, Hell's Kitchen, The Chew, Chopped, and Lidia's Kitchen. Several mentioned they prefer the food shows more than the cooking ones. The Winner from SBB #139 comments is: #2 Ricki who can make a GC choice if international or book choice from the ARC/Review titles, Christmas titles or Love titles - all linked near the end of the post. Please let me know your choice by completing the (new) WINNER FORM. Q1. Di asked a follow-up question a week or so ago to how many ereaders we have: What reader do you have and what do you like about it?? I would add - if you don't have one yet what ereader do you think you would like>? A: I still have a generation 2 Kindle. It is my third one since I first got one in Spring 2009. The first was replaced under warranty and the third I bought when the second died. I like that it can read to me while I do chores, make-up etc. Also I can make notes in the book to refer back to for reviewing. I haven't tried this on the tablet so I don't know if that works on other ereaders. One disadvantage - it clicks on each page change which drives my DH crazy. I have to plugin the earphones so he doesn't have to hear that. Image found at Maria La Chica. Thanks to those who are sending in Questions. DON'T BE SHY! Surely everyone has a Q or two you'd like to ask. Input suggestions in this Suggested Question Form. At the end of each month I draw from the suggestions I used during the month and that person will get a book choice or GC. I thank everyone for submitting questions. Thanks for sending in questions! We still have a supply of questions but from the same people so hopefully others will send more in -- even if they are duplicates I'll weed through or try to modify to use. February contributors: Liss, Margaret and Marjorie. Random Pick Winner = Marjorie. Q1. Di asked a follow-up question a week or so ago to how many ereaders we have: What reader do you have and what do you like about it?? I would add - if you don't have one yet what ereader do you think you would like?? SBB Comment Winners can choose a selection from the Valentine and "Love" books, the Christmas Giveaway Books (this is the new link), or the June 2013 Newly Updated ARC/Review List. I will pick a Comment winner from all comments made through Saturday March 8, 2014 at 5 PM central. I had a Kindle. It broke. I miss it so much. I love how easy it was to carry around my little library. 1. I have a Kindle Paperwhite and I like how light it is and that it is a touchscreen, unlike the original Kindle. I really want a Kobo Arc. I use the Kindle for PC. Its not bad, just wish I had a laptop or something to read them on that could be move to other places to read. I have been looking at the Kindle Fire HDX 7" Tablet or the Kindle DX . I also was looking at the Kindle Paperwhite 3G. I haven't really look at the details for each very hard to decide which would work best for me. I have a Nook Color which I love. The screen is large, great picture quality. My only complaint about it is it's not a good reader for reading outside or with sunglasses on. I have the same kindle ereader as you, Martha - almost filled so now downloading to the ereader app on my pc & laptop . Currently frustrated with it freezing or shutting down before search is complete [search takes forever! maybe too full???] anyway , I do appreciate the availability of a gazillion reading [&listening] opps the ereader provides! My post just disappeared so I'll try again. I have a kindle touch, but wish I would have gotten a kindle paperwhite since the one I have is hard to read in certain lights. I have a 5" Sony ereader that I bought several years ago. I love it, except that it doesn't have wifi capability, so I have to plug it in to update my books. I love the smaller size (most readers are 6") because it feels more comfortable to hold. I just got my first eReader a few months ago - a Kindle Paperwhite - I have books loaded, but haven't used it much - still prefer the print books. I have an amazon kindle, the one with the key board. I like it, however, I still prefer a paperback. I find it hard to use the keyboard. I have a Kindle Fire, but I mainly use it to catch up on emails when my children are hogging the computer. I prefer print to read. I have a Kindle and LOVE it! I have a Kindle ereader . I don't use it much I still prefer books. I would be interested in the answers as I don't have an ereader. Kindle won't work where I live due to geo restrictions. I'm not sure if I'd have the same problems with other readers. I love that you can pick your font size, it has no glare, it is light to hold and can carry tons of books! I have a kindle and I do like it but there is something about a book in my hand that wins out!! Since I don't have one, I wouldn't mind a Kindle actually, but it's not available in my country yet. I read it's easy on the eyes which makes me want it! I am thrilled to be the winner of the February contributor.